Calling all SAF students! 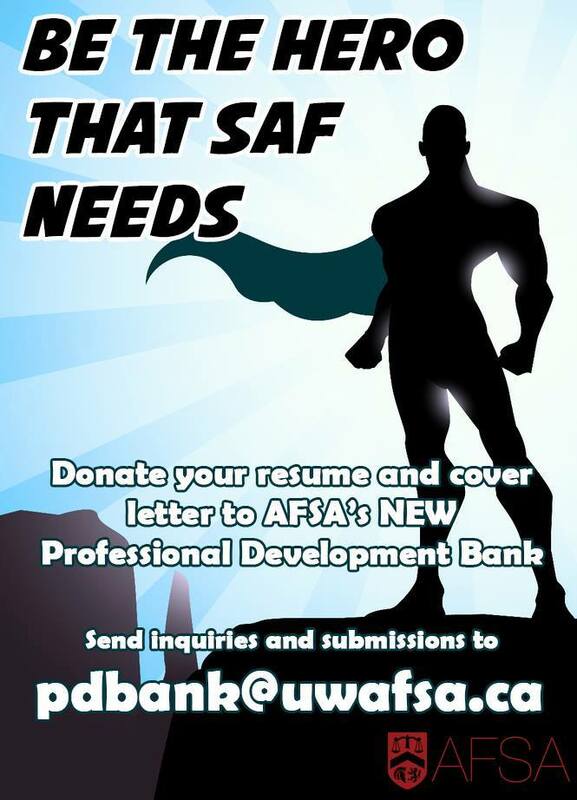 SAF needs heroes like YOU to help launch AFSA's Professional Development Bank for the next fall term by donating your resume and cover letter! We plan on hosting them all on the AFSA website for students like you to learn about how professional applications are made for different jobs and industries (Big 4, consulting etc.) And don't worry! We'll black out all your personal information including your name, contact information, organizations you've worked with and any other information that can be traced back to you. And if you want more changes, we'll make them for you! As this is a learning experience for the students who view your resume, we would like for you to donate the resume and cover letter that received an interview for the job specified. Have questions or want to donate? Send your resume and cover letter to pdbank@uwafsa.ca with your name, year, and the title of the job you applied for!